Warning: Spoilers for the fourth season ahead. Proceed with caution. When the epic finale of the third season of “Mad Men” ended with the image of Don Draper (Jon Hamm) walking into his hotel, unsure of the future that lay head, I was unsure of one thing: how could the makers of “Mad Men” possibly make an episode of television this good ever again? Well, Matthew Weiner did it again, for every single episode of the nearly flawless fourth season of “Mad Men.” “Mad Men” took the cautiously optimistic tone of “Shut the Door. Have a Seat” to a whole new level. Uneasiness seemed to be the theme of this season. Season three ended with the assassination of JFK and season four was set to the backdrop of Vietnam and the Civil Rights Movement. This is no longer the 1960s that “Mad Men” first began in where big men in big suits could sit comfortably behind their desks and ignore the problems of the world. This was a time when reality was leaking into office life. With this, we also got a changed Don Draper, for better or worse. At one point, we see him trading in whiskey for wine and even questioning his own smoking addiction and incessant love affairs. Much of this season was really about change, and how people respond to it. In addition to that, the show gave us many welcome changes. A scenery change is always good, and the new office of Sterling Cooper Draper Pryce allowed for even more pressing problems. Another welcome change was the show’s change in attitude. Despite the constantly serious subject matter, the show found a subtle, witty sense of humor this season. Much of this came through the show’s dialogue, mainly banter between the main characters. A lot of this humor also came from small, charming moments which seem inconsequential. One of the best that is easy to forget is Don and Lane (Jared Harris) sharing a bottle of whiskey in a crowded movie theater. A few of the show’s principle actors also showed a few welcome changes. Mainly young Kiernan Shipka as Sally Draper. This season, she dropped the lisp and whininess and became one of the show’s darker and more interesting characters. Season four of “Mad Men” brought the show to new levels both story wise and thematically. The characters reached new lows of desperation, whether it had to do with searching for clients or searching for lovers. In this we could find characters constantly falling back into old habits or falling into the habits of others. Every character in this mad mad world is always trying to be someone other than themselves. And at the center of this of course is Donald Draper, played as strikingly and mysteriously as ever by Jon Hamm. Like the company he helped start, Draper went on a bumpy and confusing course this season. He oscillated between redemption and past troubles. The more his secrets unraveled, the more he felt he had to beef up his fake identity. By marrying the much younger secretary over Faye, he proves to continuously try to slip back into youth rather than move forward. The greatest moments of “Mad Men” always lie in mystery and intrigue, just like with Draper himself. It’s not just mysteries like “who is Donald Draper?” it’s more like the mystery behind his true emotions and intentions. Am I the only one more interested in what Don was looking at out that window in the final shot than why Joan decided to keep Roger’s baby? Overall, the reason season four proved “Mad Men” to be the truly amazing show everyone thinks it is is because this season really proved the show’s real ambitions. It is attempting to use the past, settings, and people to re-create the idea of America. Few shows have dared try to achieve something this big since “The Sopranos” and have gotten this close to being right. This season showed us the constant rising and falling of the American Dream. As from episode one, Draper has both exemplified and put down the myth of the self made man. What category he ultimately falls into still remains a mystery. 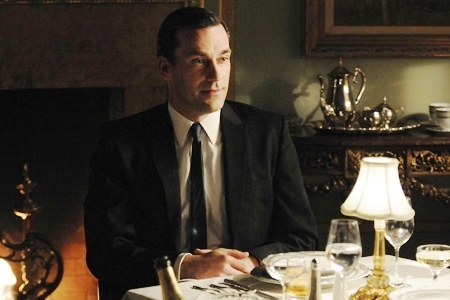 “Mad Men” has always remained fascinating because of the endless intrigue. What I love best is hard to say. It could be the fact that missing one facial expression can impact one’s perception of an episode. Or it could be how carefully every little detail is put on screen. Most importantly, I like it for a reason different from every other show I’ve ever enjoyed. While I enjoy most shows for having a sort of cinematic value, I enjoy “Mad Men” because its ambitions and overall contributions to the world are too grand to fit into one two hour time frame. 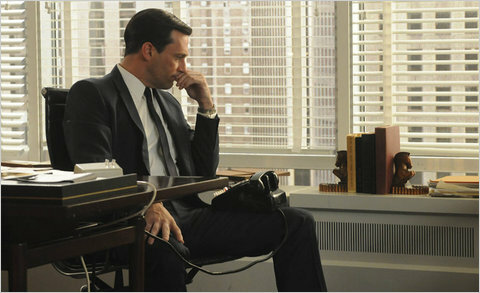 The 1960s may be over, but the era of “Mad Men” will always continue. This entry was posted in 1960s, Elisabeth Moss, January Jones, John Slattery, Jon Hamm, Mad Men, TV Review on October 18, 2010 by ian0592.